The first time I made no-knead bread a month or so ago I didn’t have an iron pot or a ceramic La Cloche to bake it in. So I baked it on my pizza stone covered with a pyrex bowl. Of course I have never used this mixing bowl in the oven before so my brain didn’t even think that it would be 500 degrees hot when I grabbed it with my bare hands to plop it on top of the bread. I got some nasty burns on my fingers that are only just now about healed. Lesson Learned. 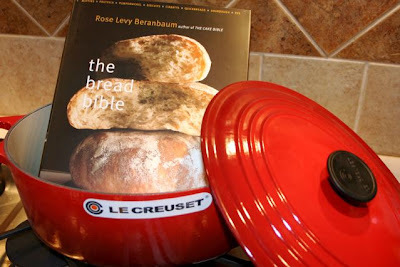 I was so happy to get my Le Creuset pot for xmas as this is perfect for making no-knead bread in. 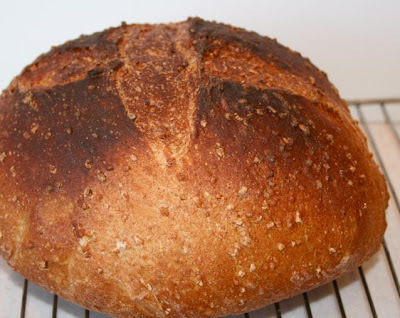 I took some liberties with the steel-cut oats no-knead bread from the breadtopia website. I actually started this bread a couple days ago. I’ll first list all the ingredients then I’ll tell you how I put it all together. At 9:45 pm Friday evening I mixed together the starter, 1 cup water, 0.5 cups each of all purpose flour and whole wheat flour. This was mixed well, covered with plastic, and allowed to sit at room temperature. My starter was directly out of the fridge and had not been refreshed so I wanted to give this bread time for the starter to come alive. The next day around 1:00 pm I mixed into the wet bubbling starter mixture another 0.5 cups of water, 1 cup of all purpose flour, 0.25 cups whole wheat flour, the steel cut oats and the salt. This was mixed well and allowed to sit out at room temperature for an hour. At that time I slightly kneaded the dough (ok, so maybe not completely no-knead). I simply folded the sticky dough over onto itself a couple dozen times right in the bowl. I didn’t want this dough to ferment too fast so I put it in the fridge for a nice overnight slow rise. This morning at 6:00 am I took the dough out of the fridge and let it warm up. I scraped the dough out onto a lightly floured board, gave it a few turns and shaped it into a ball. This was plopped onto a piece of parchment paper and placed in a bowl. I covered it with a plastic bag and left it to do it’s thing. After 3 hours it had risen nicely. I heated up my Le Creuset in a hot 500F oven. Now I had been warned that the phenolic knobs on the Le Creuset are only rated oven proof up to about 350-400 degrees so I took the handle off before heating it. Once heated the bread was baked according to instructions – first 30 minutes with the lid on, then slightly reduce the temp to 450 and bake for another 15 minutes. 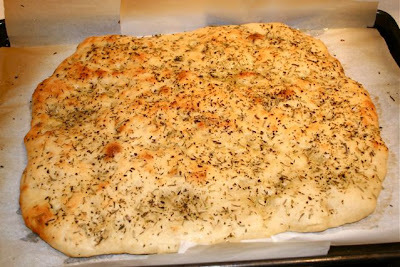 The bread turned out great. The handleless Le Creuset lid, however, was a bit unwieldy. 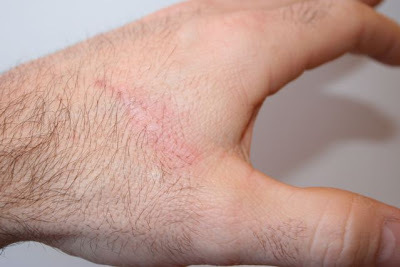 As I was wrestling it off the pot at the 30 minute time it slipped and immediately seared a nice brand into the side of my hand. Sacrifice for the bread, I say! Two for two is too much. No more. I immediately went out on the web in search of a replacement knob. I found a Le Creuset stainless steel knob for $10 and promptly placed my order. This evening I opened up a very unusual and interesting French wine from Languedoc. Minvervois to be specific. I thought this vegetative and peppery wine would go great with some Asian influenced beef. 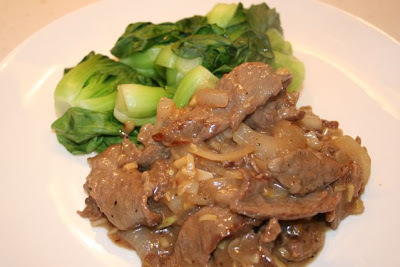 So I made a garlic beef dish served with steamed baby bok choy. I thinly sliced some ribeye steak and mixed it up with half an onion, quartered and sliced. I also added a head of garlic chopped, a splash of soy, mirin and a good shake of cornstarch. Oh, and some black pepper. This was simply stir fried in a wok until just under cooked. I added about 1/4 cup of water and covered it to let the sauce form from all the starch. It turned out pretty good. Quick and easy too. The wine matched perfectly. *edit: I also added a healthy amount of chopped fresh ginger to the mix. That is the question. Well, frankly, I prefer brining my poultry as it makes for a juicier and tastier bird. Here is a simple everyday chicken soaking in a mixture of sugar, salt and spices. For this three pound bird I let it brine for about 3 hours. A very good rinse in lots of fresh water and it was patted down with towels to dry it off. I rubbed the skin with a bit of butter and sprinkled it with salt and pepper. 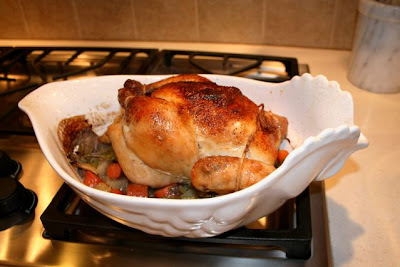 The bird was placed on top of a bed of carrots onions and celery in my favorite Revol chicken roaster. I set the oven to 450F to roast this at a high temperature. Once the internal temperature reached 170F I took it out, covered it with foil and let it rest for about 20 minutes. This day I also spent a few hours cleaning out my pantry. 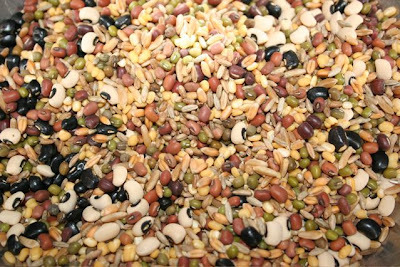 I have lots of different kinds of dried beans and grains on hand so I thought I would make a medley of healthy grains to serve with the chicken. There’s kamut and red beans and mung beans and bulgar wheat and wheat berries and spelt and thai brown rice and yellow somethings and black eyed peas and black beans and lots of other things I had. These were soaked for a few hours before being thrown into my rice cooker and cooked on the “brown rice” setting. I have been quite busy over the holidays and have lots to post in the coming weeks. Santa was good to me as you can see above. I hope everyone has a wonderful holiday and a terrific 2008.